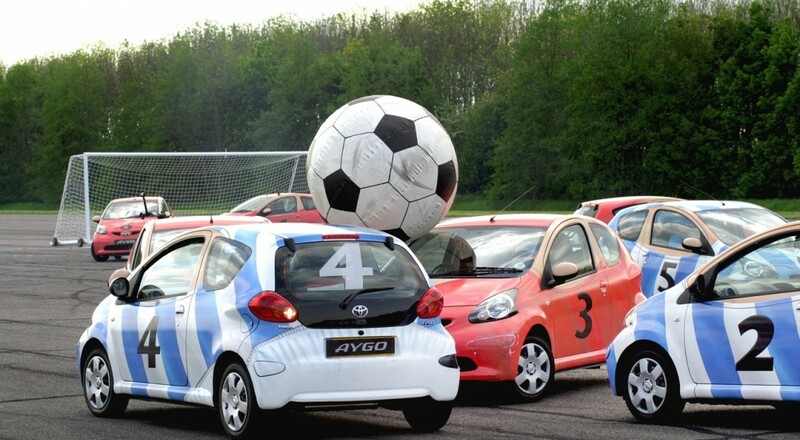 This image was named "cars-playing-soccer.jpg". The internet ain't so bad, you guys. The year is 2143. The Intercontinental Earth Union is celebrating it's 50th anniversary by putting on the most anticipated Rocket League match to date, and it's a heated one. Onlookers are devouring popcorn that tastes like if a Werther's was dipped in foie gras. Fireworks are exploding into reruns of Dharma and Greg. Cars are ramming into both gigantic soccer balls and each other. It's rad. Everything is amazing. The future rules. Go Earth. -An excited announcer moments before the Earth was obliterated by a space trucker named G'rzlneth who fell asleep at the wheel. Hey guys! We're playing games this weekend. Can you guess which? Besides Rocket League, we've got spells to sling, multiverses to protect, and witchin' to...do. Check it out! Nick Puleo (@NickPuleo) - "Going to check out Rocket League, continue my adventures in The Witcher 3 and enjoy some GTA V now that it finally works after 3 months on my PC." Marc Allie (@DjinniMan) - "I will be watching install screens on my shiny new Xbox One. If they ever get finished, I might play some Killer Instinct or Halo 2 Anniversary." Jason Love (@JLove55) - "Investing my weekend-ly allotment to Destiny, hopefully some Sentinels of the Multiverse, and more Magicka 2." Eric Murphy (@smurph_em) - "I'll be hunting terrorists in Rainbow Six Vegas 2 and maybe play some Monaco as well. Tomorrow I'll be spending most of the afternoon playing games with my girls. Minecraft, Super Mario 3d World, or Mario Kart will most likely be on their agenda." Locke Vincent (@LockeVincent) - "I'm spell slingin' in Magicka 2!" Tally Callahan - "Finally started up Danganronpa 2, so probably a lot of that this weekend." Chris Metz (@The_Lemko) - "I'll still be away volunteering. Hopefully will be back to gaming soon!" Enoch Starnes (@enochstarnes) - "I'll most likely continue my budding career as a professional Rocket League player. I may try to fit some Dungeon of the Endless or Kentucky Route Zero in there as well." Taylor Killian - "I'm gonna be flip kicking semi-trucks into colossal, nuclear soccer balls in the sport of the future on Rocket League."